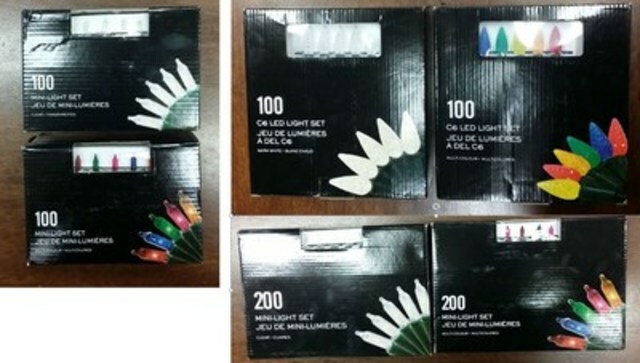 TORONTO, Nov. 20, 2015 /CNW/ - On behalf of the manufacturer, Shoppers Drug Mart is voluntarily recalling indoor and outdoor seasonal lights since the products did not meet CSA standards and may pose a fire/electrical hazard. The product has been sold in Shoppers Drug Mart store since October 1st. See attached photos. The products listed above are being recalled since they did not meet CSA standards and may pose a fire/electric shock hazard. No customer complaints have been reported and all units have been removed from store shelves. Customers should return the product to the place of purchase for a full refund, with or without a receipt. For more information regarding the recall, customers can contact: Customer Service 1-800-746-7737. Shoppers Drug Mart Corporation is one of the most recognized and trusted names in Canadian retailing. The Company is the licensor of full-service retail drug stores operating under the name Shoppers Drug Mart (Pharmaprix in Québec). With more than 1,258 Shoppers Drug Mart and Pharmaprix stores operating in prime locations in each province and two territories, the Company is one of the most convenient retailers in Canada. The Company also licenses or owns 51 medical clinic pharmacies operating under the name Shoppers Simply Pharmacy (Pharmaprix Simplement Santé in Québec) and six luxury beauty destinations operating as Murale. As well, the Company owns and operates over 50 Shoppers Home Health Care stores, making it the largest Canadian retailer of home healthcare products and services. In addition to its retail store network, the Company owns Shoppers Drug Mart Specialty Health Network Inc., a provider of specialty drug distribution, pharmacy and comprehensive patient support services, and MediSystem Technologies Inc., a provider of pharmaceutical products and services to long-term care facilities. Shoppers Drug Mart is a unique and independent operating division of Loblaw Companies Limited. For further information: visit www.shoppersdrugmart.ca.